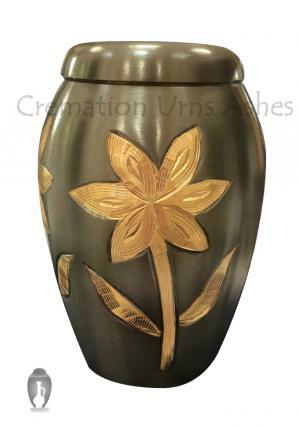 Mini cremation keepsake urn for human ashes are decorated in brightness with astonishing and delightful nature of lilies spread around the mini floral urn. As the lilies are part of every occasion we deal with in our daily life and could be one of the best loved flowers of the demised or the family. The lilies are widespread with gold bordering and background with shining metallic finish in black. 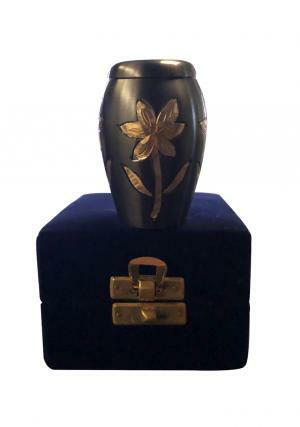 Small funeral urn is made of brass metal, decorated with handcrafted lilies. The mini ceremonial urn comes out with a flat lid decorated with lily and has a secure threaded lid for an easy open or closure of the urn. The ashes in the small containers are secured as of the memories of the demised. Memorial urn holds upto 3 cubic inches of ashes and dimension of this urn is 2.56” inches height, 1.77” inches width and weighs 0.15 kg.